LORIN ROCHE, PhD began meditating in a physiology lab at the University of California in 1968 and immediately fell in love with the practice. He began teaching meditation in 1970 and earned his doctorate from University of California, Irvine for his work on the subjective experience of meditation. He trains meditation teachers worldwide and specializes in helping people customize individual meditation practices to align with their unique nature. Rather than imposing a standardized, one-size-fits-all model, he has drawn on insights from the best of Western science and Eastern yoga to create his own approach called Instinctive Meditation. Dr. Roche is the author of Meditation Made Easy, The Radiance Sutras: 112 Gateways to the Yoga of Wonder and Delight, and, with his wife Camille Maurine, Meditation Secrets for Women: Discovering Your Passion, Pleasure, and Inner Peace. CAMILLE MAURINE is an intrepid traveler on the path of embodiment, venturing high and low into the world of energy and love. Her work is an intimate fusion of meditation, movement, and expression, with a keen passion for women’s spiritual empowerment. She is the author of the groundbreaking book, Meditation Secrets for Women: Discovering Your Passion, Pleasure, and Inner Peace, as well as Meditation 24/7: Practices to Enlighten Every Moment of the Day, both written with her husband, Dr. Lorin Roche. Renowned for her scintillating embodiments of feminine energy, Camille loves performing excerpts from The Radiance Sutras, Lorin Roche’s sensuous version of the Bhairava Tantra, an ancient meditation text. 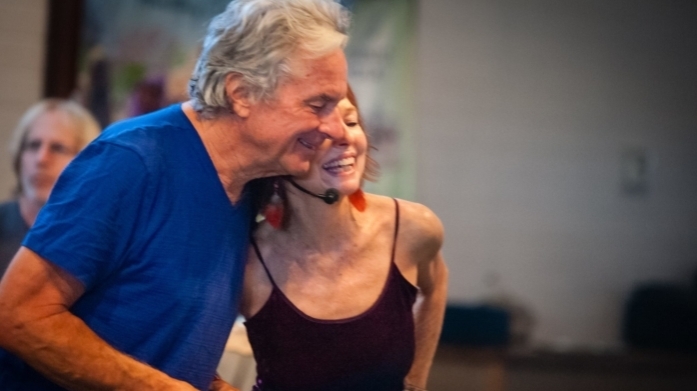 Sharing her journey of over four decades of teaching and thirty-five years of intimate relationship, Camille invites us into the mystery of being alive.